The ITS organisation is based around five broad service areas. Each area owns a set of discrete services – each service has a Service Owner and a service Team. One service team can deliver more than one service, but they would normally be complementary to each other. ITS delivers approximately 24 discrete services that are described in our service catalogue. Each service is managed by a Service Owner. Services are monitored through a monthly Service Review Board where all Service Owners meet with IT managers and staff who work with user groups.Some service have additional dedicated Service Boards where users of the service meet with the Service Owner and members of the service team. In addition to Service Teams and the Service Review Board, the Service Desk and Business and Service Analysis team provide a mechanism for users to raise queations about services and propose changes. In addition to ITS roles and teams there are other groups within the University that influence the services to be delivered. 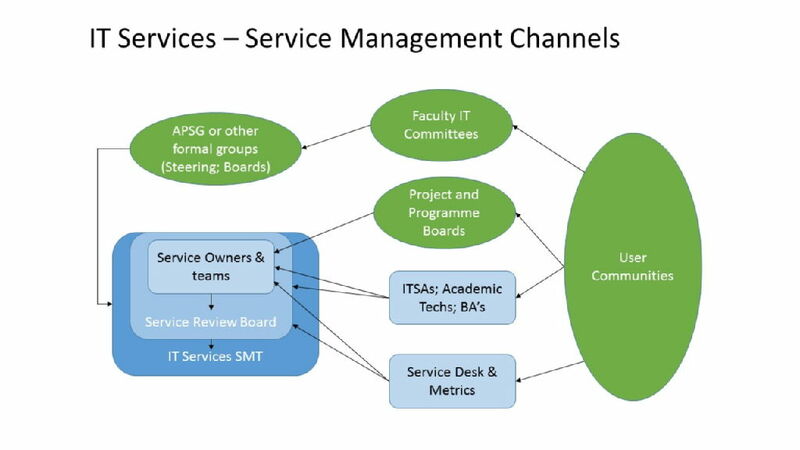 Faculty IT committees provide input through Service Boards and the Business and Service Analysis team – as well as providing more formal input through releant project and programme boards. Administrative and Professional Services Group also acts as a formal route to request service changes, updates and reports. APSG is a formally constituted University committee and has responsibility for agreeing overall strategic direction in the development and allocation of information resources.